The Mr. Christmas LIghts and Sounds lighting outlet powers up to 7200 lights and synchroinizes them to 20 songs. It’s been said that 35% of the population put up Christmas lights during the holidays. Which is cool, but only about one percent of that group go all out and have a light show (remember the Wizards of Winter light show video on YouTube?). Well those who brave the snow to erect their lights, just don’t want to go to the trouble to set up tons of lights and blow molds and then connect them to a computer. Most people who do start doing that in August. Most don’t think of putting up lights until the weekend after Thanksgiving. Too bad there isn’t a one stop shop for helping the average Joe to take his light display to the next level. Enter Mr. Christmas. The Mr. Christmas Lights and Sounds of Christmas lighting outlet can power 7,200 miniature lights from it’s six power outlets, and can be programmed to synchronize your lights to twenty different holiday songs. In order to ensure people can hear the those tunes, the Outlet comes with a portable speaker with full volume control and the ability to play the songs either in order or at random. Alternatively, you can always set up your own playlist to skip a few songs along the way. 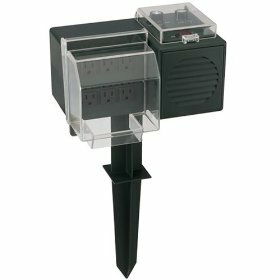 Completely weatherized to guard against moisture and dirt, the Mr. Christmas Lights and Sounds of Christmas lighting outlet is UL listed for outdoor use. Cost is about $116 from Amazon. Hi are these available in the uk ? As that would be brilliant if not they would have to over come the voltage change if anyone could inform me that would be brill ta !